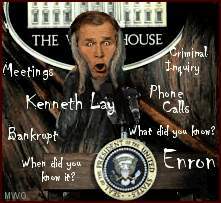 Bush is toast... and his nightmare's Kenneth Lay. And he will roast... as the Czar for Enron's way. Let's send Bush home right now. Throw Bush out... throw him out Election Day. He's all about... crooked people who must pay. More song parodies from the EnronGate Song Book Page!